The 5 Star Movement's flagship commitment, the "citizenship income" will eventually be subject to very restrictive conditions. The scene, which lasted only a few moments, is like a perfect summary of the atypical functioning of the current Italian government. Thursday, January 17 in the evening, in the press room of the Chigi Palace, when just announced the adoption of decrees laying down the terms of the two flagship measures of the political program of the coalition, the income of citizenship and the "quota 100 "(Pension reform), the President of the Council Giuseppe Conte appeared, flanked by his two deputy prime ministers, Matteo Salvini (League, extreme right) and Luigi Di Maio (Movement 5 Stars, anti-system). For the photographers, the three men each held up a placard on a blue background. On those of Luigi Di Maio and Giuseppe Conte, the names of the two measures could be read. On that of Matteo Salvini, no trace of the income of citizenship: it is written only "quota 100". Notoriously opposed to a device wanted since the beginning by the 5 Stars, the strong man of the League ostensibly displays his opposition to this measure, which he has just adopted. And that does not prevent him from smiling kindly, like the others, before the objectives. After months of false tracks and test balls, nervous breakdowns and threats of rupture, the Italian government has managed to reach an agreement. In the coming weeks should thus come into effect the "citizenship income", commitment of always 5 Stars. 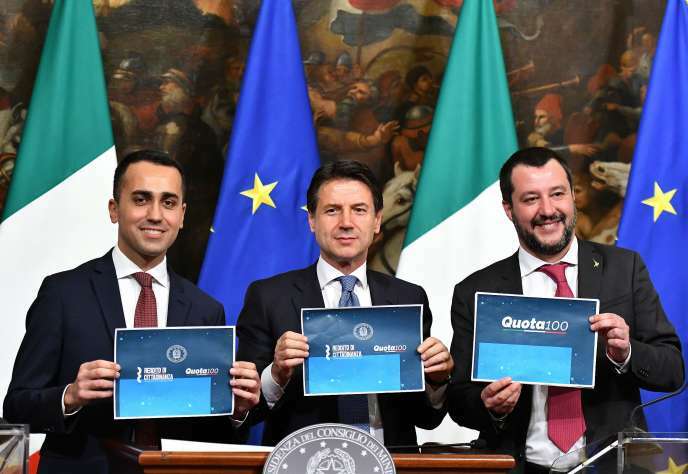 "It's a dream come true," immediately triumphed the political leader of the movement, Luigi Di Maio, without dwelling too much on the many amendments made to a project that has little to do with the original idea. Initially wanted by the founder of the movement, Beppe Grillo, as the first step towards the universal income, the citizenship income will be presented as a temporary indemnity (no more than 18 months, renewable once), necessarily associated with the search for a employment. To collect it, you must have lived in Italy for more than ten years (including the last two years), and declare less than 9,360 euros a year in income - 780 euros per month, the statistical threshold of poverty in Italy. Its amount will be calculated by family unit, and can go up to 780 euros per month (500 + 280 housing assistance) for a single person, 1330 euros for a family. And it will come with many haircuts: according to its designers, 5 million people are concerned, for a total effort of 7 billion euros by the community, which amounts to saying that the average amount of aid will amount to little more than 100 euros per person per month.